It's been a long time coming, but it's finally here: easy, digital, automated authorization in U.S. controlled airspace. 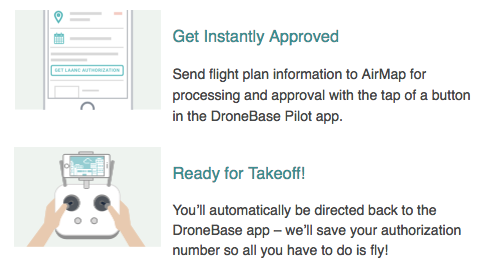 Thanks to our partners at AirMap, LAANC automatic approvals are available for all pilots from right within the DroneBase App. You'll get a notification if you're in an area with LAANC-enabled airspace, and our app will take you through the approval process in a matter of taps. In most cases, pilots will receive automatic approval in a matter of seconds. This is especially exciting for DroneBase Pilots: automated authorization unlocks areas like suburbs and cities near airports that were previously deemed as restricted airspace. "LAANC is a game-changer for DroneBase because it opens up locations that were previously difficult to fly in due to regulations and airspace restrictions. Even though many of our drone flights would have never impacted manned aircraft, the sheer proximity of certain locations to nearby airports made it impossible to fly," said Nick Osgood, DroneBase's Head of Operations. "For example, we could have been in restricted airspace 2 miles away from an airport, but a Mission might only require we fly up to 25 feet - lower than the palm trees here in LA, let alone an airplane! Still we were unable to dispatch those Missions to our Pilots," he continued. Not only does our LAANC integration mean a more seamless flight process, it also means more missions in the future for our Pilot Network! Be sure to use our LAANC integration for your next mission, and stay tuned for more flight opportunities in the future! Start using our LAANC integration today! Download the latest version of the DroneBase App in the App Store or Google Play store. Looking for more information? You can also review the complete list of LAANC active airspaces here. Previous PostThe Best of the Worst Drone Fails!